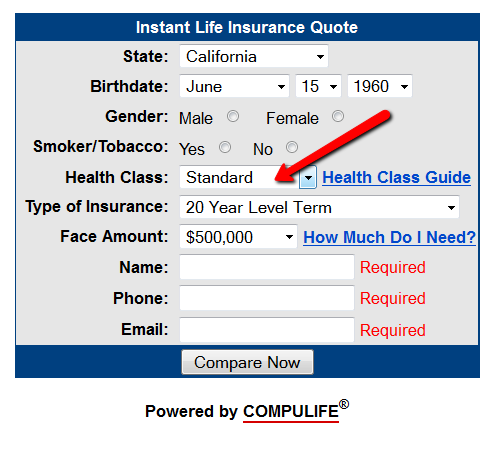 A “Severe Substandard” life insurance classification is generally applied to an applicant who is healthy enough to be approved for life insurance, but due to a high risk medical condition, will be asked to pay a higher premium than healthier applicants. When you complete our quote form, quotes will be displayed for the “Standard” rating immediately. You can expect your premium to be approximately 150% higher than the “Standard” premium quoted. To calculate, simply multiply by 2.5. Will it Be Exactly 150% More? Please note substandard ratings are officially labeled as “table ratings” by life insurance carriers. So if you get approved at a severe substandard rating, the insurance company might actually call it Table F or Table 6. Most companies charge 25% per table below the standard rating. It’s possible you could get approved anywhere from Table F to Table J (tables 6 to 10) rating, which would cost 150%-250% more than the standard rating, but the most common of the these is Table F, which is why we show a 150% addition. Keep in mind our articles are merely a guide to how you will be rated. The only way to know for sure what your actual rating will be is to apply for coverage, and see what health class you are approved at. If you apply for coverage, there is no obligation to buy. We can help you apply if you call us at 877-443-9467.